FREE SHIPPING FOR THE MANORWOOD BEST BARN KIT WHEN SHIPPED TO THE LOWER 48 STATES. 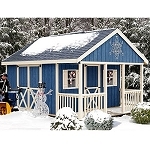 This 12' Barn Kit Shed will be a great addition to any yard. It provides an attractive comfortable way to store any of your garden and yard tools. It has a 4'x8' front covered porch that can be located on the right if needed. It has two different entries, a 28" door and 5'4" double doors. The siding has vertical grooves that give an attractive plank look. They are primed so you can paint the color of your choice (latex acrylic paint is recommended). The siding is treated with composibor and prevents fungal decay and insect damage. The siding is manufactured with wood strands that are pressed into a resin saturated substrate making it superior to plywood. 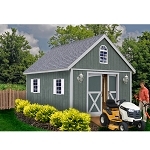 The Best Barn wood shed kit components fit easily into place with no special tools or skills required. For extra strength to the trusses, metal hurricane truss hangers are provided to secure trusses to the exterior walls. All required hardware is included. Roof edge and the shingles are provided by owner. Choose one of the two floor designs to best suite your needs. If you have an already existing foundation, cement slab, blacktop or gravel base, the standard floor kid is best. You can use bricks or patio stones to level the 2x4 treated framing. This floor includes treated 2 x 4's 16" o.c. and 5/8" OSB. If you would like to set your foundation directly on grass, the deluxe floor kit would be floor for you. It includes 4x4 treated runners and give support to the floor joists. Raising the foundation above the ground the 4 x 4's allow air to flow an eliminate moisture. This kit includes 4x4 treated runners, treated 2 x 4's 16" o.c. and 3/4" plywood. All nails are included The floor does require cutting and assembly and floor sheathing is not treated. Gable overhang to help protect against the elements. 2 entry doors: 28" door and 5'4" double door. Sturdy built truss system with 40 lbs. snow load and 90 mph wind load. Pre-cut trim for perfect fit. Competitive Edge Products, Inc. is an authorized distributor of Manorwood Best Barn Kit. Our shed kits are made with high quality material and are inspected individually before shipping out. Damaged and defective items are extremely rare. If you receive something damaged or defective please let us know and we will get you taken care of quickly and at no additional cost. Our job is to make sure you get exactly what you paid for and in a timely fashion. Please note that if the pallet has damage it should be noted with the driver. The driver will have you sign for the order and if you notice any damage we recommend noting that with the driver. That helps to ensure that we can send you a replacement and that we can file a claim with the freight company. Note, you do not have to do any paperwork or file any claims if something is damaged. We make it as simple as possible, but it is required to note any damage with the driver on the paperwork when you sign for the delivery. If you have any questions we are here to help so please ask. Buyers remorse - please note that these are very heavy items and we pay a sizable amount in shipping and handling to get these to you (shipping is free to you). Please check with your local city and county office buildings to ensure that you are able to put in a storage shed. Please check with your local HOA as well. If you decide to return the storage shed for these reasons please keep in mind there is a 15% restocking fee and the freight incurred to get it too and from is not refunded. Again, if anything is damaged or defective we send out the parts at no additional cost. Dimensions: 84" x 48" x 30"